“Venom” is a forgettable solo flick, leaving the audience with only a disturbing memory of the alien monster’s weirdly long tongue. In 2007, an amorphous, gooey, and extraterrestrial symbiote called Venom made his first big-screen appearance in the film “Spider-Man 3.” He has been regarded as one of Marvel’s most titular antagonists and formidable foes, taking over several different humans to control and manifest in. However, this debut served injustice for the alien villain, as this movie bounced from subplot to subplot and essentially shoved him to the sidelines, much to many fans’ dismay. So when it was announced the movie “Venom” would hit theaters this fall, there was a tinge of hope that a stand-alone film would redeem this noxious anti-hero with the spotlight he deserves. Unfortunately, history repeated itself, and the film missed its mark, delivering a subpar plot tainted with dull, messy action and an inconsistent tone of humor and drama. The film opens with a spacecraft belonging to the bioengineering corporation Life Foundation, bringing four alien life-forms back to Earth for lab testing. Leading the experiment, supergenius CEO and megalomaniac, Carlton Drake (Riz Ahmed), learns that these beings survive on foreign land when attached to specific human hosts. So he gratuitously begins to run human trials, using participants like guinea pigs to achieve symbiosis and risking the death of the human hosts who reject the connection. Enter Eddie Brock (Tom Hardy), an investigative journalist who discovers these corrupt methods through confidential emails and sets out with a gung-ho spirit to expose Carlton’s corporate evil. With the aid of Dora Skirth (Jenny Slate), a scientist who deviates from the heinous experiments, Eddie breaks into the research facility, only to be possessed by a dark, viscous specimen and to be given its enhancing powers. Successfully regulating symbiosis with his body, the ominous organism named Venom leeches onto Eddie, who devolves into madness while learning how to appease a permanent parasite that can read his entire psyche, including his thoughts and feelings. With another sentient creature linked to the main character’s mental and emotional state, viewers would think the film goes on to explore their rare bond using gradual, reciprocated understanding. However, “Venom” botches this opportunity, resulting in its lack of heart and sentiment. There is an absence of the connection between the two imperative pillars of the movie, Venom and Eddie. The film doesn’t take time to justify or develop their begrudgingly co-dependent relationship. So, their character arcs grow rashly and unrealistically, losing viewers’ investment of the narrative. Accordingly, it feels unusual when they begin to “act as one” later in the film because the audience hasn’t witnessed any on-screen development of their mutual trust. Even from the first scene, there is zero chemistry between the characters, which tarnishes the story’s “hook” with a banal and unengaging impression. Though both Hardy and Michelle Williams, who plays Anne Weying, are talented, big-name actors, their interactions as romantic partners and eventual exes feel cliche and jaded. Not to mention, their portrayals of their respective characters also lack nuance and charm, perhaps due to the ham-fisted script they had to muscle through. The core problem with “Venom” is that it forgets a basic tenet of cinematic worldbuilding: Show, don’t tell. Since no depth emanates from these characters, the movie falls flat and comes off as ingenuine and dissatisfying. 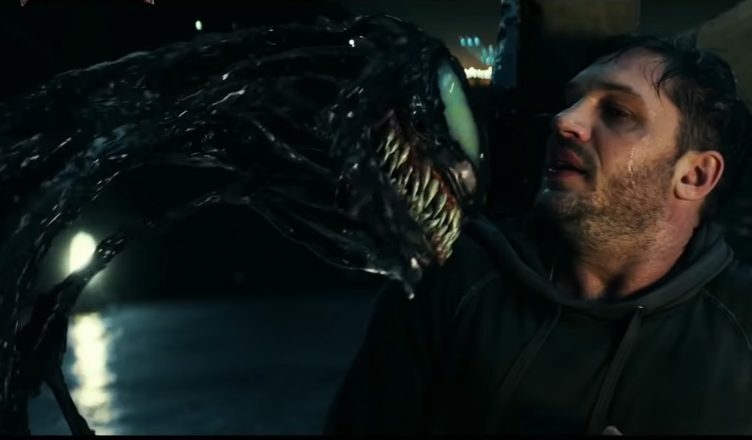 Although the film attempts to follow the Marvel Cinematic Universe’s light-hearted tone by providing snippy banter between Venom and Eddie, the early moments of Venom casually and playfully poking fun at Eddie feel out-of-character for the menacing creature. The majority of the jokes don’t land, feeling clunky or mishandled with the dark undercurrents of the movie. The movie has a confusing tone overall because it attempts to blend in too many different tones. In many instances, it jumps from a sullen mood to an immediate comedic vibe, which hampers the viewers from being fully immersed into the film’s atmosphere. There was great potential for exploring substantive themes through the more mature aspects of the narrative, such as Venom impermissibly encroaching Eddie’s private life or the two’s jarring-to-respectful relationship. Instead, the movie wedges unconvincing rapport and cringe-inducing one-liners in-between earnest moments and limp action scenes, making the entire movie feel one-dimensional and juvenile. “Venom” could have been a saving grace for its introduction in the infamous “Spider-Man 3” or at least expanded on either Eddie’s or Venom’s cinematic origin. However, the tonal inconsistency and poorly fleshed-out characters churn out a blockbuster that is not intriguing. It is merely a passable, insipid movie that can best be rated with an indifferent shrug.